On May 2, the Syrian Military Intelligence detected and seized a weapon shipment, which was on its way from southern Syria to the besieged militants in the northern Homs countryside, according to the Syrian Arab News Agency (SANA). The shipment included dozens of US-made M72 LAW anti-tank rockets, dozens of mortar and RPG rounds, a Soviet-made Konkurs Anti-Tank Guided Missile (ATGM) and a large amount of ammunition for 12,7, 14,5 and 23mm machine guns. A second shipment containing Israel-made medicine and medical supplies was seized by the Syrian Military Intelligence in the Damascus desert. The SANA said that the second shipment had also been on its way to the besieged militants in the Eastern Homs countryside. More than 2,000 militants have been besieged by the SAA in the northern Homs countryside and parts of the southern Hama countryside since late 2012. Currently, the Damascus government is in the final stage of negotiations with the militants to lift the siege in exchange for the withdrawal of the terrorist elements. 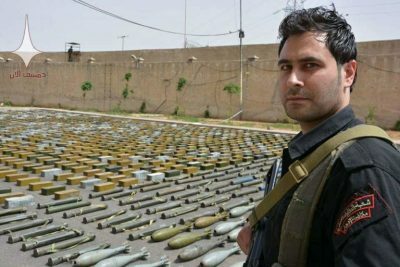 Observers believe that these weapons and medical supplies are an attempt to encourage the besieged militants in northern Homs to reject any peaceful agreement. Some sources believe that the Israeli intelligence may be behind this failed attempt. All images in this article are from Damascus Now.